I was rather shy as child. I wish there had been a children’s version of this around in my local library. It would have needed to be much simpler – as even as an adult I got a little overwhelmed with all the ‘techniques’ – over 90! Rather than directly praising someone Leil advises using the grapevine to spread your message. The example she gives is in a work setting (Ruth did an amazing job on the website project) but I imagine that this will work in any situation. Imagine: instead of gossiping about your friends, pass on some praise. 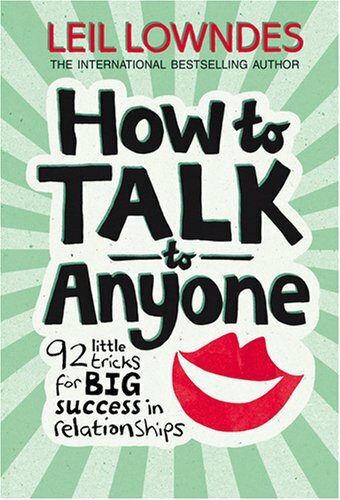 If you’ve read a few of these communication books (particularly verbal skills) then you’ll come across this often – but it’s worth repeating. The trick is to play to a persons strongest sense. The three are visual, auditory (sound) and kinaesthetic (feeling). Most people are more dominant in one area. The trick is to figure out what it is and then use it. For example I’m an auditory person so I love it when people respond to me with things like “that sounds good” or “can you hear me out”. On a related note, if you’re looking for books along these lines then Dale Carnegie’s book (with a odd title): How to Win Friends and Influence People is the best I’ve read. I also recommend their courses – once you’ve bellowed like Tarzan (yes I did this) to a room full of people you can guarantee that your ‘shyness’ will have fled the room! If you like the sound of Leil’s book then grab it here.